This is our custom-built Mogami 2319 with 1/8"-3.5mm locking connector to a selection of connectors for Sennheiser wireless receiver output. 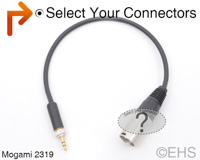 This is a custom cable similar to Sennheiser's CL100 that connects a wireless receiver pack. Construction is Neutrik and Switchcraft connectors with Mogami 2319 cable. Neutrik and Switchcraft connectors are some of the best connectors around. Mogami 2319 cable is very flexible, durable, light-weight cable. Photo 1 shows a 1' cable with nickel XLR male and 1/8" connectors. Photo 2 shows one option for the cable with nickel XLR male and 1/8" connectors.